A book to raise the spirits and warm the heart. 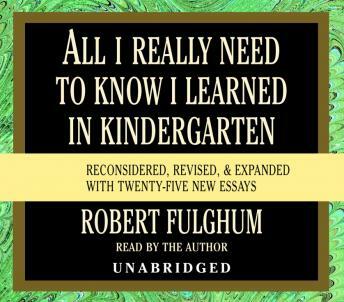 Includes the famous Kindergarten essay that was read on the floor of the U.S. Senate. This was the best book out of my summer reading assignment. The narrator is indeed a bit mundane but, if you put the speed up to X1.25 it's bearable. This book is a collection of short stories about life, there are no specific fact or figures or data. Itâ€™s a good review of some basic and important life lessons, so itâ€™s worth reading. But itâ€™s very â€œfolksyâ€ and written from the point of view of an ex-preacher. His voice can be soothing at times, but a little â€“ whatâ€™s the word, maybe patronizing? â€“ at times. This would have been easier to listen to if the author/narrator didn't sound half asleep all the time. some of it was amusing and interesting. Not my favorite book. It seemed kind of slow at first, maybe even boring. When I really started to listen and give the stories a chance, I found it touches your heart and reminds you of the little things in life that really do remind you of love. And therefore matter. I found the stories insightful, positive and uplifting. Inspiring hope and sincerity into my life. While depressed and self centered, I found that relating to other peoples life events is human and love. Opening my mind and inviting love, I am glad I picked up this audiobook. Thank you. I loved the book and the reader. I would recommend this to anyone, and would listen to it again sometime! This is a classic. This one didn't do it for me. The author seems like a really nice person, and he had some very cute little stories, but I really didn't see any point to most of them. Maybe I'm just too shallow! The narrator is a drone--I didn't last 5 mins with the monotonous cadence and boring narration. Waste of Time. read in a monotone voice. This may have been a good book a long time a go but please. I absolutely loved this book. The narrator's voice was soothing, NOT boring. He told the stories with great zest and comedy. I highly recommend the book to anyone and everyone.